I’m finally beginning to get off on weigelas. My snobbery toward shrubs that deliver lovely blooms but add little value to the landscape the other eleven months of the year (lilacs leap to mind) led me to ignore this genus for a long time. When I started gardening, weigelas had nondescript green leaves that did nothing in the fall beyond turn brown and fall off. 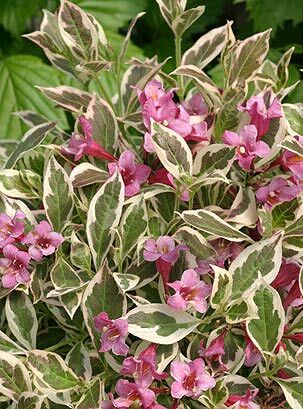 It’s a dwarf, the smallest weigela you can grow, only hitting 18-20” in height with a dense spread to 24”. Cool to use near the front of the perennial border and as an understory plant to evergreen shrubs. The large and distinct white margin emerges pink in spring, then matures to a clean white with what looks like a paintbrush-splash of dark green in the center. Soft pink flowers appear in great profusion spring through early summer, with noticeable though mild repeat bloom. The foliage keeps the plant a focal point from spring through fall; alas, there is no late fall color change, except to the aforementioned brown. Obviously a shrub to consider for small yards and close spaces. This is a very cool shrub to grow all season in a large container, popping it into the ground in the fall for overwintering. Grow in sun to part sun. Weigelas get a bit thin and straggly over time unless they get a good solid block of five hours direct sunlight. Plant in soil that drains well, but beyond that weigelas are not too picky about soil. Medium moisture. If shaping is necessary, prune right after flowering. A Proven Winners selection.